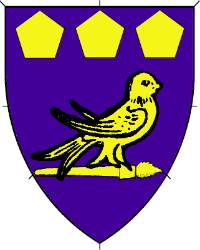 Purpure, a martlet contourny atop an artist's paintbrush fesswise reversed, in chief three pentagons Or. Name registered with the College of Arms in July 2013. Device registered with the College of Arms in October 2016.